That’s a sentiment that we heard over and over again last weekend as we handed out 20,000 Smiley Cookies to exhausted runners at the Pittsburgh Marathon. Flattered doesn’t begin to describe our reaction – running 26.2 miles for one of our signature treats is quite a compliment! Though race day dawned dreary and wet, the runners weren’t deterred by the rain, and neither were we. 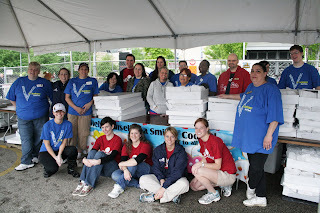 At 3:30 AM, our 20,000 cookies were delivered to the tent we occupied just beyond the finish line in front of Heinz Field. Soon after, our team of 17 volunteers and Team Smiley began bagging them individually in preparation for the flood of runners we’d be seeing later that morning. 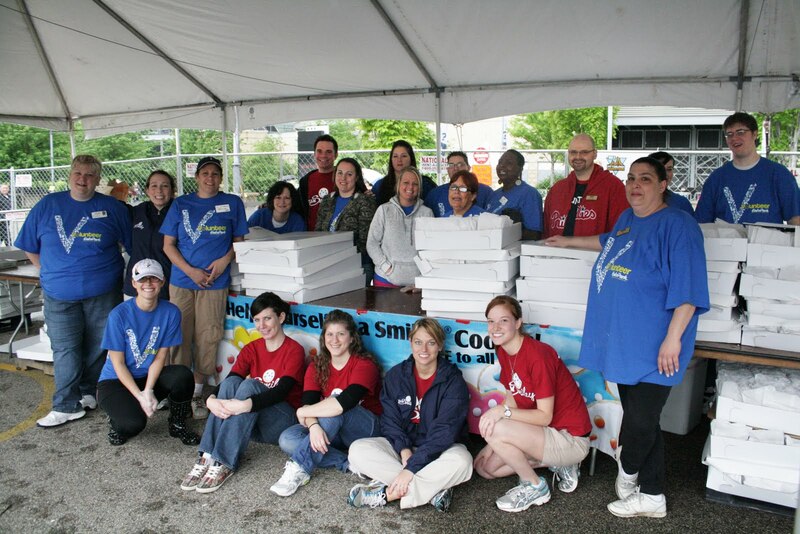 Our team takes a break after bagging 20,000 Smiley Cookies! By 8:30 that morning, ALL of the cookies were ready to go – good timing, because that’s when the first of the runners began to cross the finish line. The first finishers had run the half-marathon – and despite the rain and physical exertion that had just endured, they were all smiles. Race finishers stop to pick up a Smiley Cookie from one of our volunteers. Gradually, the rain cleared up and we began to see runners who had finished the full marathon. What an accomplishment! It was almost unbelievable to see how many people had turned out for the race. In all, there were more than 4,200 finishers in the full marathon, and nearly 9,000 in the half. Together, they ran more than 220,000 miles that day. That’s enough to circle the Earth – NINE times! We were happy to be a part of such a great event, especially with our vow to promote healthy lifestyles through our LifeSmiles program. It was truly inspiring to see so many people who had made the commitment to train and participate in the race. We can’t wait for next year! One of the marathon finishers enjoys a Smiley Cookie. A sweet ending to a long race! Smiley rocked this weekend at the OROC (Outrun Ovarian Cancer) race at the Rock and Roll Hall of Fame in Cleveland, Ohio. Runners and walkers enjoyed Smiley cookies to fuel up and as a great post-run snack! Smiley was also there in person showing off his best dance moves and cheering on his friends during the race. Other attractions included face painting, hula hooping, and pictures where kids got to dress up like a rock star. The event was a great success and everyone seemed to really enjoy themselves. Some people even said the cookie was their motivation during the race!